(N. Ripley 2018) 13NR129B (Thistles & Thorns x Deadliest Catch) Tet. 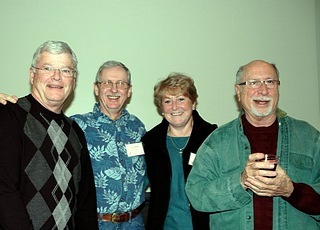 Grit Your Teeth is my 4th introduction with what I consider teeth, from my program. It is a mid to late season bloomer and seems to be in bloom the rest of the summer. 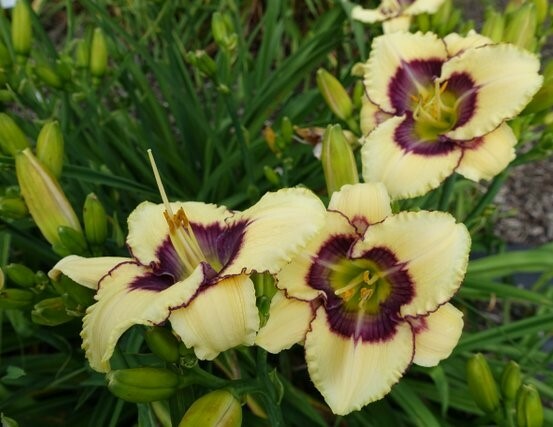 Instant rebloomer, 4-way branching, fertile both ways, warm or cool weather creamy teeth show and the flower opens nicely. 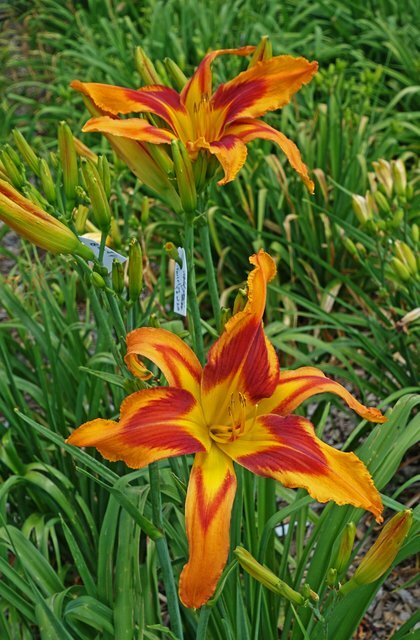 Flower 5.75” depending on moisture, 30-32” height, wonderful 4 way branching, bud count 20. Grit Your Teeth is a semi-evergreen. The color for me is an unusual shade of rose red and sometimes shows a shade of purple eye. I only see this color in the shade. This plant is in the field, no shade but when I brought it to the golf cart I did see it. Has a really nice green throat. Bonus it has fragrance. Double fan $200. Sold out. Please contact me if you wish to be on the list. This plant is the best instant rebloomer in my garden. Let me share with you and show you with photos what instant rebloom means to me: First scape is up and blooming, second scape comes up at the base of the same fan with flowers that bloom. So you have 2 scapes from the same fan. What could be better then ‘more flowers’. OH my I have worked very hard to get this in my plants. We have been in a drought like many parts of the country last summer and fall. Last summer when we were very dry this plant still put out instant reblooming scapes. It is a mid to late season bloomer and that is why it is important for northern gardens to have instant rebloom. I set pods late on it and then when the pod is at least grape size you can cut the scapes off and put the scapes in a bucket 1/4 full of water. I bring the bucket into the barn/or garage to let the pods finish making seeds. Those that know me know I do my “Happy singing dance” when I find a treasure in my garden. I am not sure my friends know what I am singing but they do join in when it comes to I know, I know, I know, I know, God is on the move, on the move Hallelujah, God is on the move In many mighty ways. Here is the first of the song: Anytime a heart turns from darkness to light, Anytime temptation comes and someone stands to fight, Anytime somebody lives to serve and not be served. Needless to say it is one of my favorite songs. So now you know we sing and dance in my garden. It happens the first time I see a new flower I am shown such grace that I have to sing. If you have heard my voice you know why I only sing in the garden. So here are some stats & information to go with the pictures I am showing you. 4 way branching, fertile both ways, warm or cool weather creamy teeth show and the flower opens nicely. I am showing you a close-up picture of one of the petals so you can see the end of the petal, it is open with a almost square end to the petal. This helps the petals open easily when the ruffled flowers have a blunt end on the petal. The ruffles in this case are teeth and they don’t get caught so it opens nicely without hanging up. A favorite of the Wisconsin hybridizers who visited our garden in 2016 on a 100 degree day. We had a great time, come back you guys! (N. Ripley 2018) Tet. ATTITUDE WITH GRATITUDE 11NR289B (Supreme Scream x Free Wheelin) 9-11” flower, depending on if it curls backwards, 43-45” height, semi-green, early season, rebloom. Early morning opener, very hardy in my garden. Attitude With Gratitude is a perfect name for this flower. Shamelessly it flaunts large brightly colored flowers on scapes standing tall in the garden. It is striking to see this plant in the garden for so many reasons. Bright orange, dark red orange eye that points out on the petals. Red orange chevron on the sepals, very eye popping. ATTITUDE WITH GRATITUDE is a perfect name for this flower early morning opener. 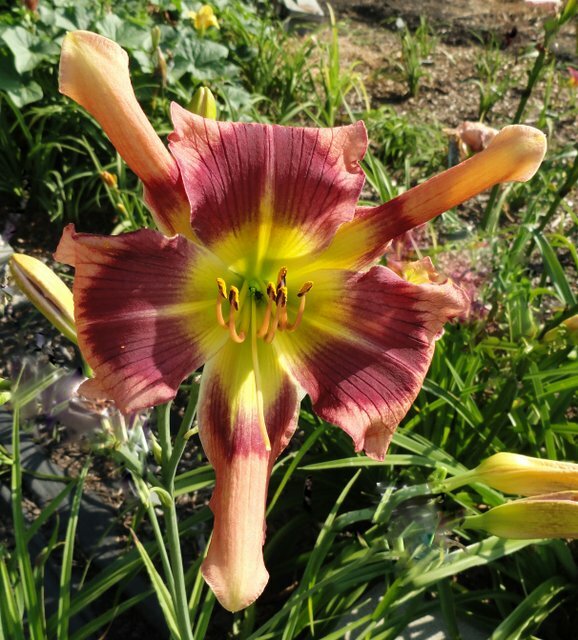 Large flower 9-11”, tall 43-45”, Semi-green, reblooms, with strong straight scapes that do not bend. Fertile both ways. I planted ten seeds to gauge what different looks I might see. Most were nice but I selected five to move. Then after being moved one took off like a house afire. Has been my pick since then and has not disappointed me. I love when I use my plants for parents. Double fan $100. Sold out. 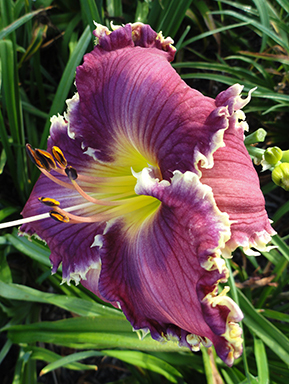 (N. Ripley 2018) Tet Conquering King, 12NR126 (Bali Watercolor x Twiggy’s Lavender) flower 7.5”, height 38”, rich purple bitone, hardy semi-evergreen in our garden. We have watched this flower mature since the first bloom in 2013. 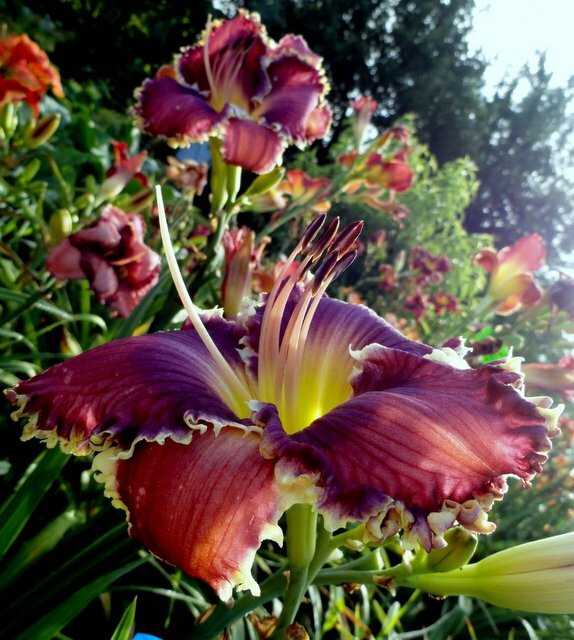 Each year getting better, taller, petals never pinch, the sepals are a paler shade of purple. Plant increases nicely and sets pods. I am not sure why I didn’t start using this flower until last year. This past summer we had drought and I wanted to see how this plant would handle the lack of water. It had always put up so many scapes and flowers were exciting. 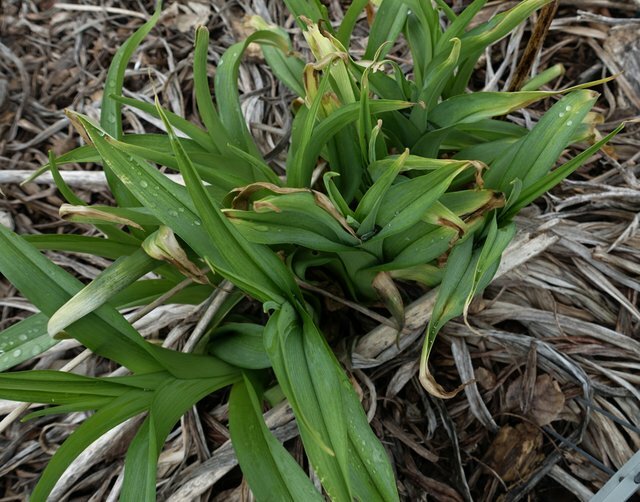 It didn’t seem to notice the lack of water and is an early bloomer, could be the reason. Conquering King set pods and the pollen was fertile. It didn’t rebloom as much as it has in the past, so I will say some rebloom. It might have been the lack of rain. 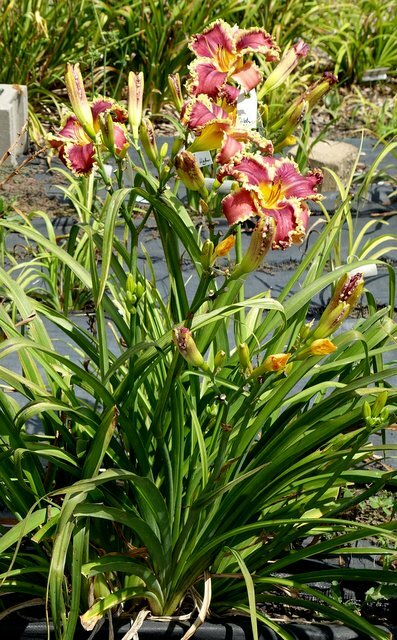 About the parents: Bali Watercolor has always been a very reliable plant in our garden but has never rebloomed. Bali Watercolor always came back and increased but not as happy as Conquering King. The funky look of Twiggy’s Lavender is fun. So happy to see a little darker color on Conquering King than both of the parents. Darker color may come from grandparent Royal Celebration who is also a parent of our Scarlet Pimpernel. Conquering King is also taller than both parents as they stand in my garden. Scapes are straight up and strong to hold lots of large blooms and fragrant. Fertile both way. Double fan $100.00. 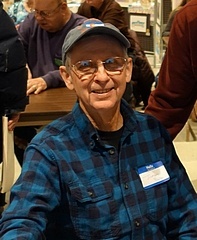 (N. Ripley 2018) Tet. DANCING AWAY WITH MY HEART 12NR277 (Rolling Raven x Rip’s Royal Purple) Naming my plants for introduction is a very fun part of the process for me. 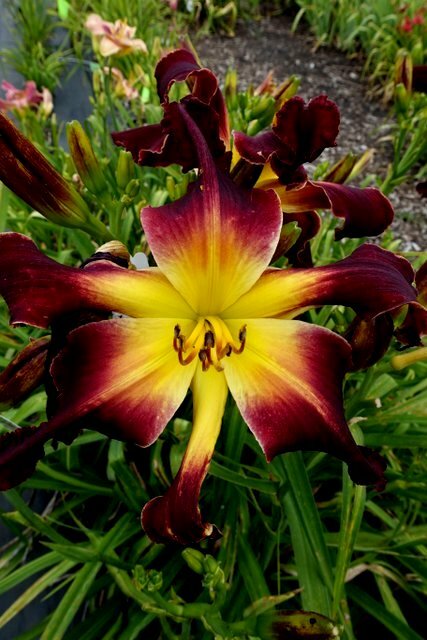 This flower is a deep dark rich burgundy with a glowing yellow throat going into green. It has lots of diamond dusting showing off on the petals. It has been gratifying watching this plant’s progress from year to year in becoming an introduction. The name 'Dancing Away With My Heart' is so fitting for this flower. 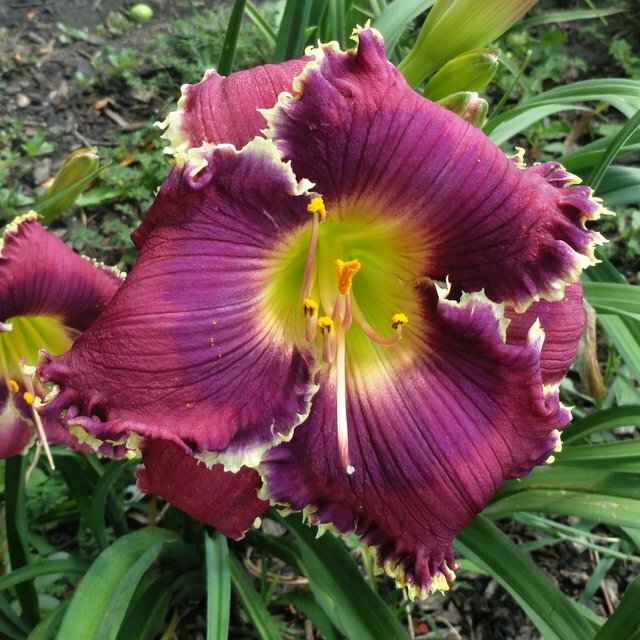 One of the parents is my introduction of last year 'Rip's Royal Purple' named for my husband. My husband Rip, then my 'boyfriend', that has been a long time ago, took me dancing Saturday nights when we were going together. This was one of my favorite things to do when I was in school. Music and dancing....remember those days? So there are two connections to my husband with this flower. The other reason for this name is the flower standing tall dancing high on the wind. 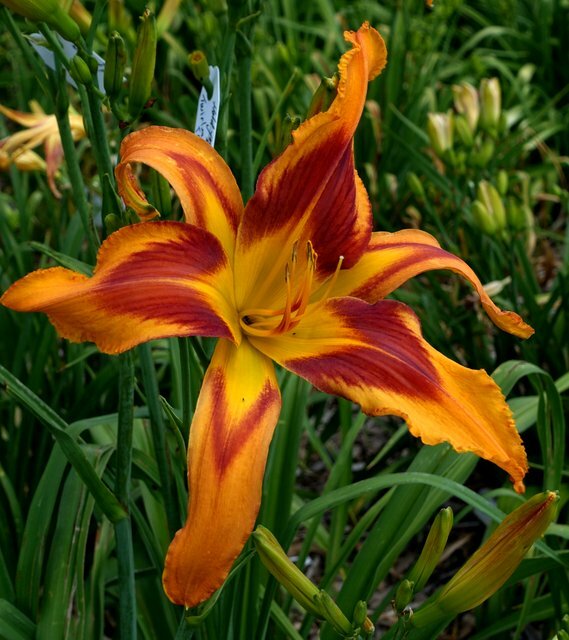 The petals and sepals form changes during the season making it a true unusual polymorphic form. 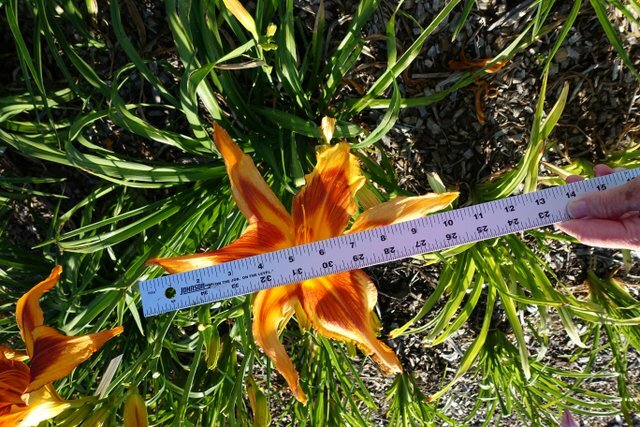 Flower measured flat 7” longer pulled out, height 43", branching 3-4 way, buds 13-20, midseason rebloomer, diurnal, semi-evergreen, has some fragrance, ruffling on petals, fertile both ways. Double fan $100.00. (N. Ripley 2018) Tet Faithful Rainbow Connection 11NR038A (05NR429 (Rushing Delight x Linda’s Magic) x Winifred Esther) Semi-evergreen, 6” flower, height 27”, straight scapes, with nice 4 way branching, 15 – 18 buds, early bloomer, once in awhile it will poly. What a fun flower with rainbow colors, as you can guess the garden name of this flower is Rainbow. When I see Rainbow, it reminds me of its parent Winifred Esther and the wonderful woman it was named after. This flower makes you think of rainbows and the connection rainbows have with the promise. “God knew they might be fearful, so in His sweet mercy He made a covenant, a promise, to Noah and all the earth. In this covenant, God promised unconditionally that He would never send another flood to destroy all life on the earth. In Genesis 9, God sealed His promise with a rainbow in the sky”. Plants looks great in the front of the border. The petals start with violet purple bleeding into a bluish eye, flowing to a lovely pale cream throat with a green eye in the center. Star shape with the sepal curling back. Putting Faithful Rainbow Connection with patterns just came naturally and I can’t wait to see what the seedlings look like next summer. Great increaser with clean foliage, easy fertile for me. Double fan $75.00. (N. Ripley 2018) Tet Love of Jules, 09NR322 (Michael Bennett x Ninja Night). This flower is in honor of our much loved nice Julie Diane Annis, who left this earth in November 2017. Her sweet daughter, my lovely grandniece Shailey Letts, and June Ripley Kirkpatrick (my husband’s sister) and Jules' mother picked this flower to be named to honor Jules. Jules died much too soon and will always be in our hearts. We know Jules is in God’s loving arms, in no pain, and watching over her dear daughter Shailey from Heaven. 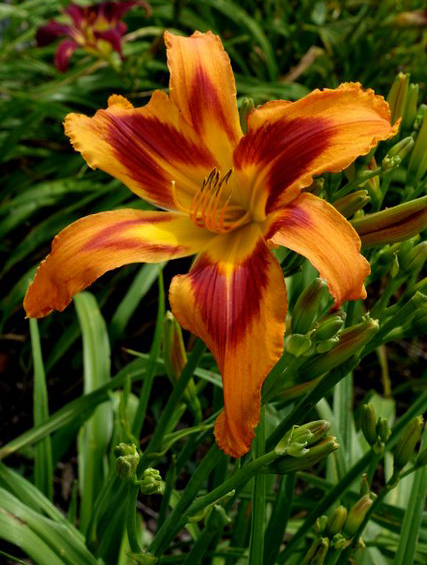 Jules is a great garden plant with lots of large flowers that are fertile both ways. Dormant, 3-way branching showing off an average of 18 blooms, in a great color combination of reddish purple, with a lovely large blueish eye moving down to a green throat. Thin white edge on petals and sepals complete the flowers. Scapes height average 28” and show off the diamond dusted flowers well. Sold out until all family members have a plant. (N. Ripley 2018) Dip Army of Angels, 13NRD017E (Seedling 08NRD202D x Zebe) Think about an Army of large bright pink diamond dusted flowers marching across your yard..that is what I see when I look at Army of Angels. In the pictures, you can tell I needed to lineout or divide the clump, but I was using it so heavy I didn’t want to stress it until fall. It is a mighty increaser and I would expect this coming from the pollen parent our ‘Zebe’. I feel the bright color is coming from Nathan Sommers through Zebe and our seedling. Height 34”, Large Flower 7.5”- 8” dormant, blooming early with rebloom, Oh so Bright clean pink color saturation to the max! Fragrant, flowers dance above the foliage with glee. 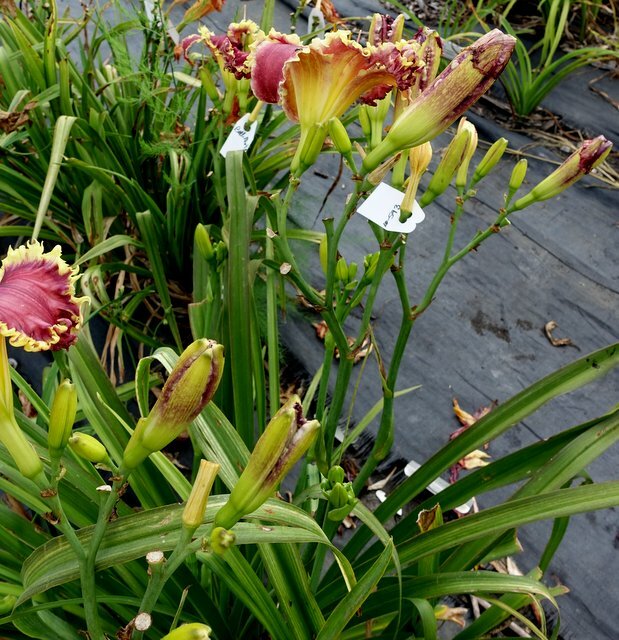 This plant is a doer, with flower power, and scapes that stand straight no matter how many flowers are blooming. Cream throat going into a green eye, great scapes with 3 to 4 way branching 18-20 buds on mature plant. Midrib carries a white line on lightly ruffled petals. Sepals always have a perfect curl at the end. Good increaser and pod & pollen fertile $100.00 double fan.